General Admission, a surf and lifestyle shop on Brooks Ave. will be hosting an event Thursday night benefitting A Walk on Water, a surf therapy program. 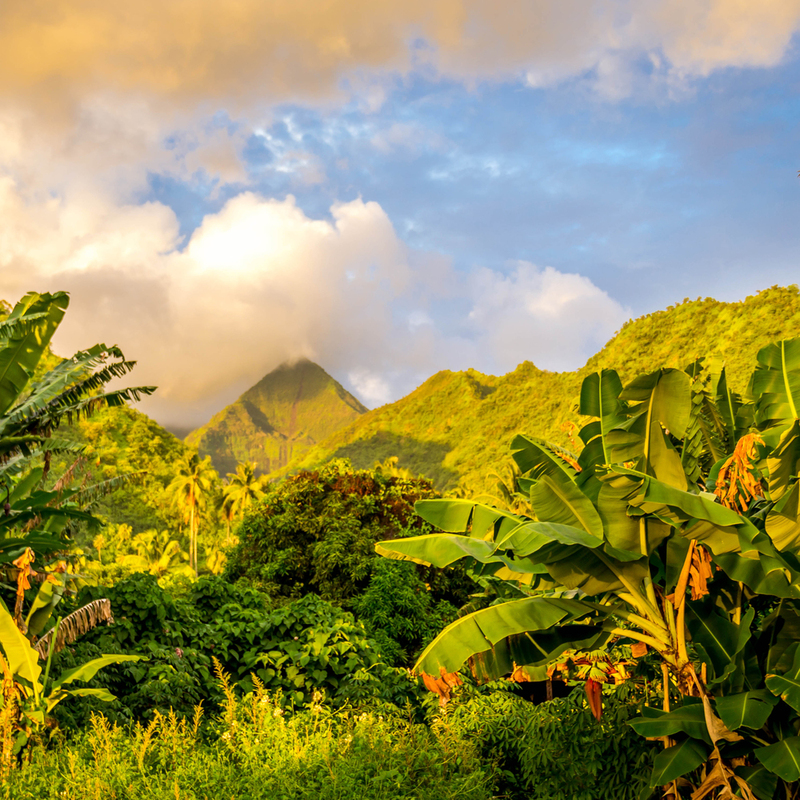 Tiny Atlas Quarterly, the lifestyle + travel magazine, curated a photography exhibit, "Go Where It's Green" for the night and and there will be a fun, interactive component to the show as well. AllSwell also collaborated with Tiny Atlas to create a new line of travel notebooks to celebrate the event along with the surf + photo trips now being offered. For more information on participating events or to submit your event, visit Venice Art Crawl. The quarterly Venice Art Crawl returns with dozens of events, pop-up galleries and special discounts at restaurants and shops throughout the neighborhood on Thursday, September 17, starting at 6 p.m.. 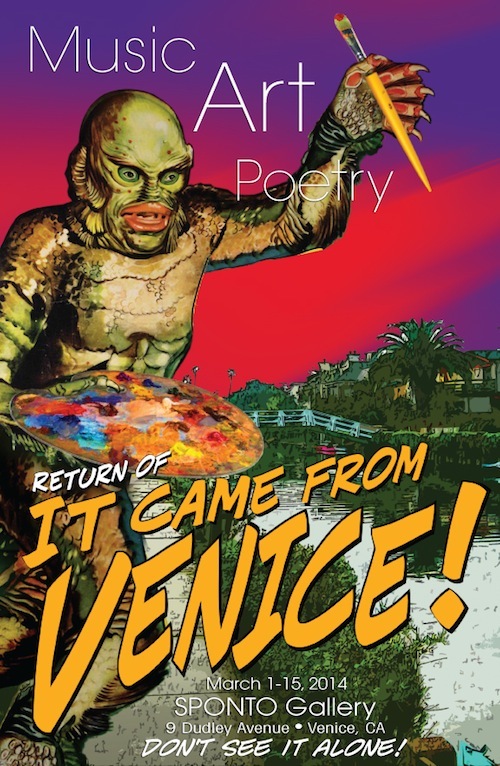 Check the Venice Art Crawl site as they map out locations for the evening's festivities. Venice-based photographer and graphic artist Jason Hill debuts his first solo photography series "Venice Art Walls" at WNDO Space gallery Friday night. The hand-painted photographic prints capture the vivid, saturated color of the iconic public art walls in his unique style that is both timeless and reminiscent of Venice's early days of surf and skate culture. Enjoy fresh air and fresh art—the quarterly Venice Art Crawl returns Thursday, June 18, starting at 6 p.m. Venues throughout the neighborhood, including art studios and galleries, as well as shops and restaurants with special exhibits and performances, will feature a varied assortment of evening entertainment. See the full lineup of events here. Visit more than 40 independent Venice artists in their natural habitat this Sunday, June 7, as they open their private studios to the public for a free collective showcase known as ArtBlock. It runs from 11 a.m. to 6 p.m. and includes 24 stops throughout Venice, from Rose Ave. to Venice Blvd, from Lincoln Blvd. down to Speedway. See the map below for a complete list of participating studios, or pick up a printed map on the day of the event at Fourth St. and Sunset Ave. Performance art and live music will highlight the first Venice Art Crawl of the year on Thursday March 19 from 6 to 10 p.m. with the hub of activity taking place at a block party just off Abbot Kinney. Read the story here. A new gallery debuts on Lincoln Blvd. featuring a solo show by Priscilla Witte. Read the full story here. BAM Fest returns to the 18th Street Arts Center this weekend with unlimited beer tastings from 40+ craft breweries, art installations, food trucks and vendors, and live music and entertainment. Bringing back its popular annual fundraiser Beer, Art, & Music Festival (BAM) for a special edition in honor of the Center's 25th Anniversary. This afternoon art festival includes 40+ craft breweries, open artist studios, live music, and contemporary art ‘crash courses’. Stop by Thursday evening for Coldsmoke Co.'s apparel trunk show and see featured works by Eddie Wall, Pascal Shirley, Mike Parillo Fine Art, and see some live painting action by The Art of Chase. Bites and refreshments will be provided by Black Mask Spiced Pacific Rum & The Jolly Oyster. All skate and snowboards provided by Loaded Boards. Proceeds from the night benefit Venice Family Clinic. 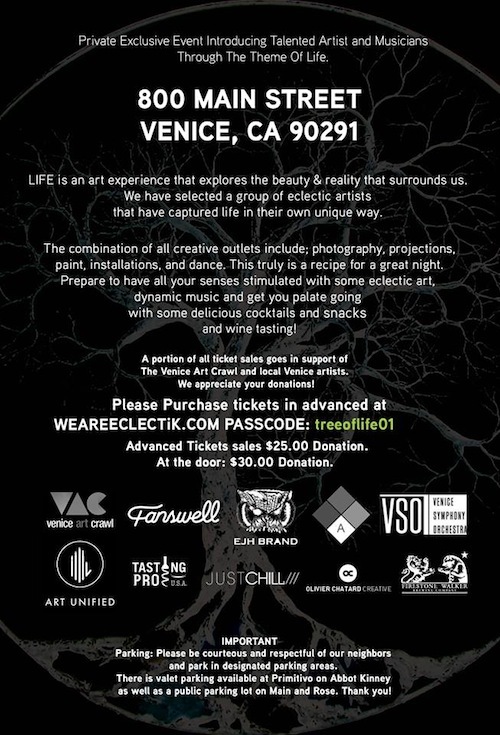 Come out to Danny's to network and plan the next Venice Art Crawl on December 18. It's a great way to meet gallery owners, artists, and musicians in the Venice art scene. SYSTEMATIC opens at the WNDO Space featuring emerging artists Bisco Smith, Dfalt, with installations by Venice mainstay, Jim Budman. The show consists of mix media work and installation exploring social and philosophical systems of space, balance, and tension. WNDO is a unique multipurpose creative space in the heart of Venice, CA. WNDO’s aim is to create a revolving home to artists, events, and experience. The quarterly Art Crawl returns Thursday with 40 stops on the official VAC map, including dinner and happy hour specials mixed in among the art shows, and a block party on Rose Ave with live painting, music, art cars, and glow-in-the-dark performance art. Start crawling at 6 p.m. Block party at 7 p.m. See you out there. Mixed media art show featuring local works of photography, projections, paint, installations and dance, all exploring the theme of life, beauty and reality. Produced and curated by Olivier Chatard and Venice Art Crawl's Nicole Muyingo. A portion of proceeds benefits the Venice Art Crawl and local artists. Glow is an all-night interactive art event that illuminates Santa Monica beach in a wash of color. Want to become part of the performance art? Download the Colorfields app and your smartphone will become an instrument of color and sound!